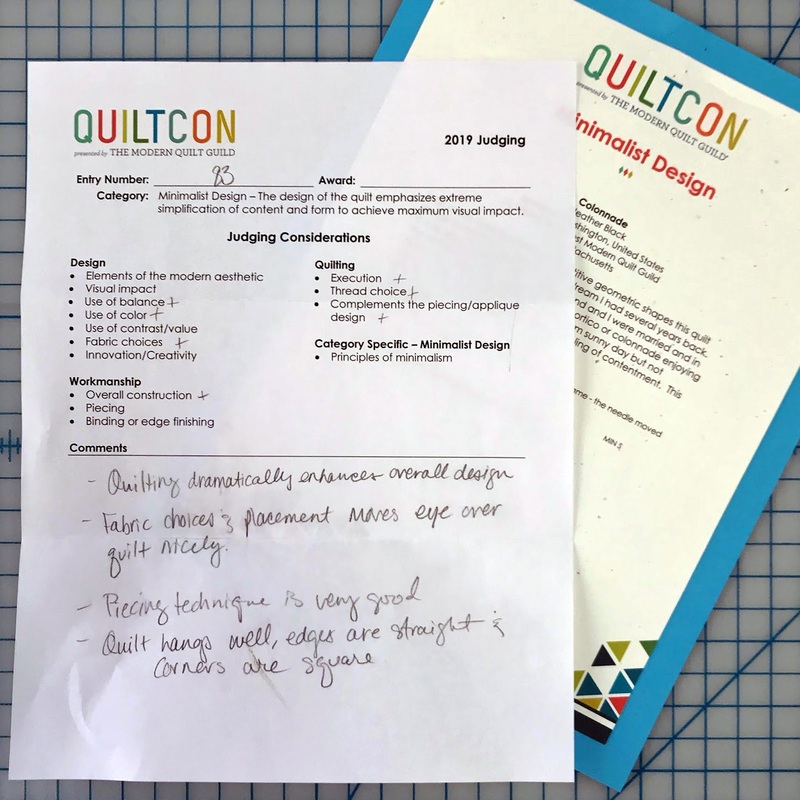 QuiltCon judges notes vary from other quilt shows in that they don't give a quantified score. Pluses next to one of the considerations indicates that the quilt being evaluated excelled in that area, or at least that is how it has been explained to me and then the judges leave comments on the bottom of the page. 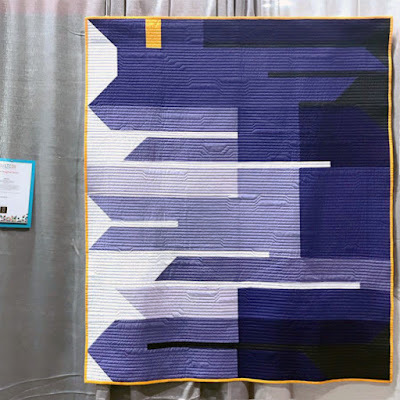 I think Colonnade is one of my highest "scoring" quilts I've ever had at QuiltCon, even more than Urban Trek that won a first place ribbon. 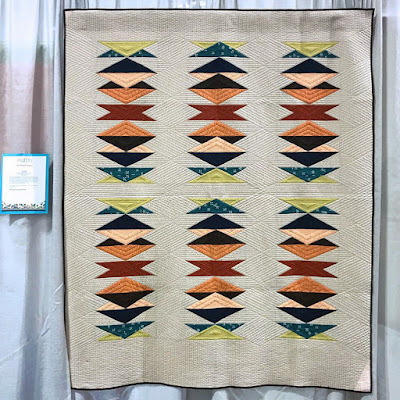 Another quilt that did well at this year's show was Fringe Area. I wasn't holding out too much hope for Fringe Area winning a ribbon. 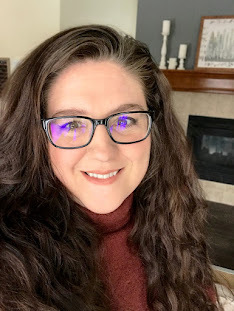 I constructed this top at a quilt retreat and it isn't the best quality, though I really do love the quilting on this one. 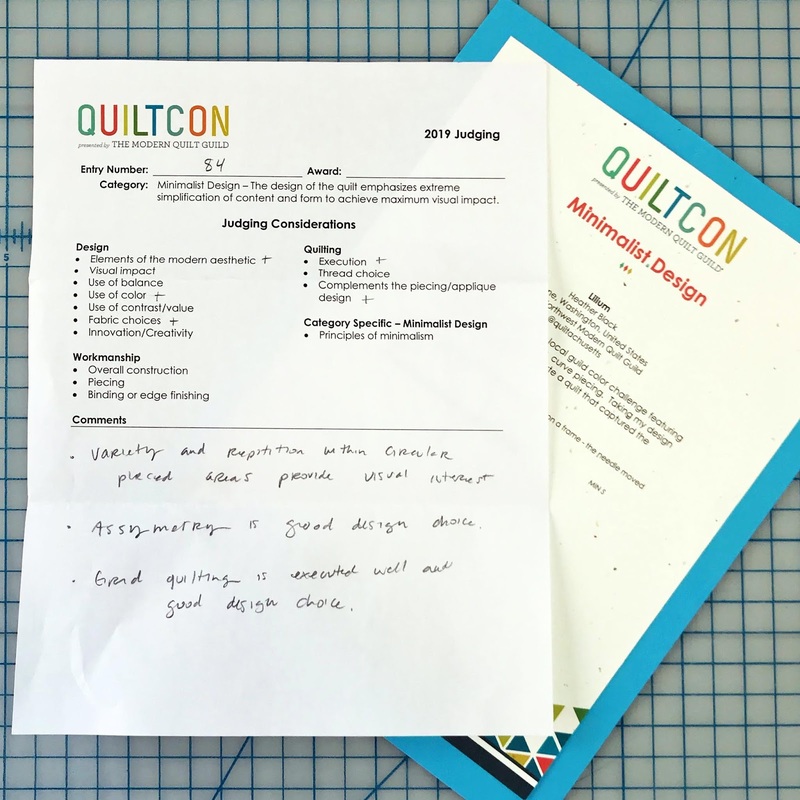 The judges seemed to be impressed with the design and had some positive feedback for this quilt that was nice to read. 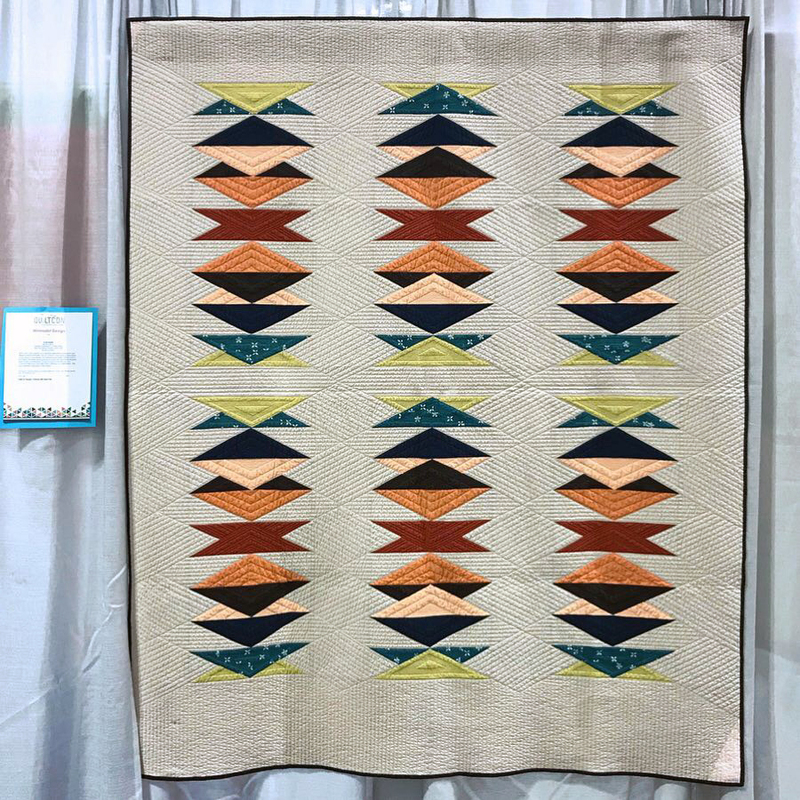 The third judge quilt I had in the show was Lilium. 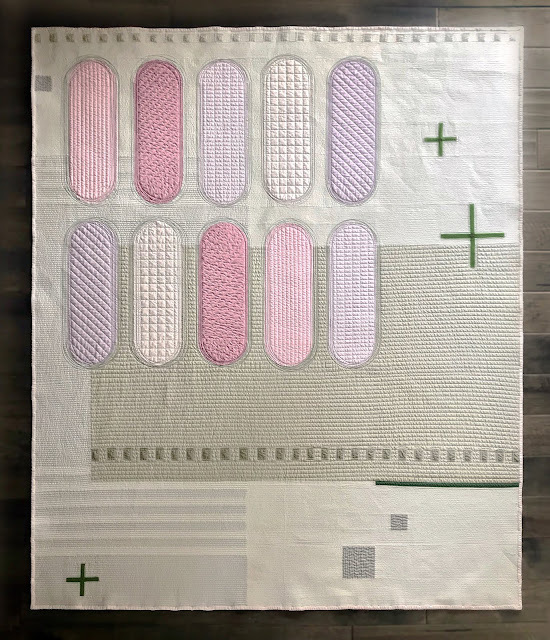 I really love this quilt because it was one of the first quilts I completed on my longarm. 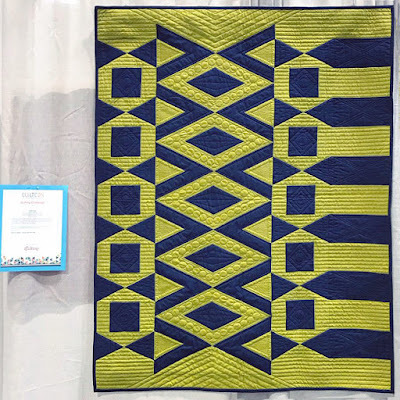 I knew there were some quilting issues with this quilt but overall I think it fared well with the judges. I designed and made Pickle Knots for the two color challenge and this is actually the second show I've had it at. The first show the judge notes were brutal. They did not think it was constructed well and they did not like that I stitched next to the ditch and not in it (I've ran into that comment before). 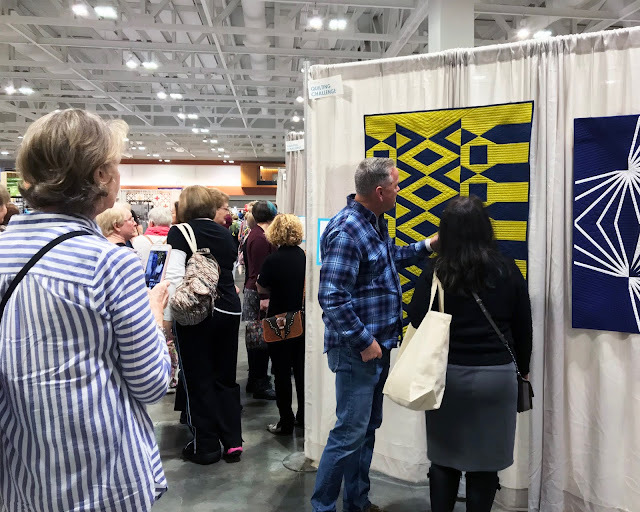 I was a little torn when I saw it was accepted into QuiltCon fearing all the previous judges comments would magically be displayed in a banner for all to see. Of course they weren't and to my surprise I received a "+" for piecing. 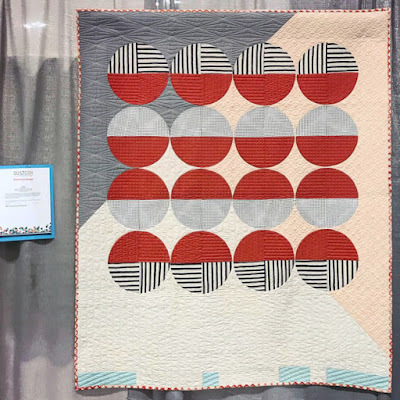 The quilts in the Quilt of the Month showcase were not judged, Positive Illuminations and Jawbreakers. Now for the giveaway quilt, Keyhole Kaleidoscope. 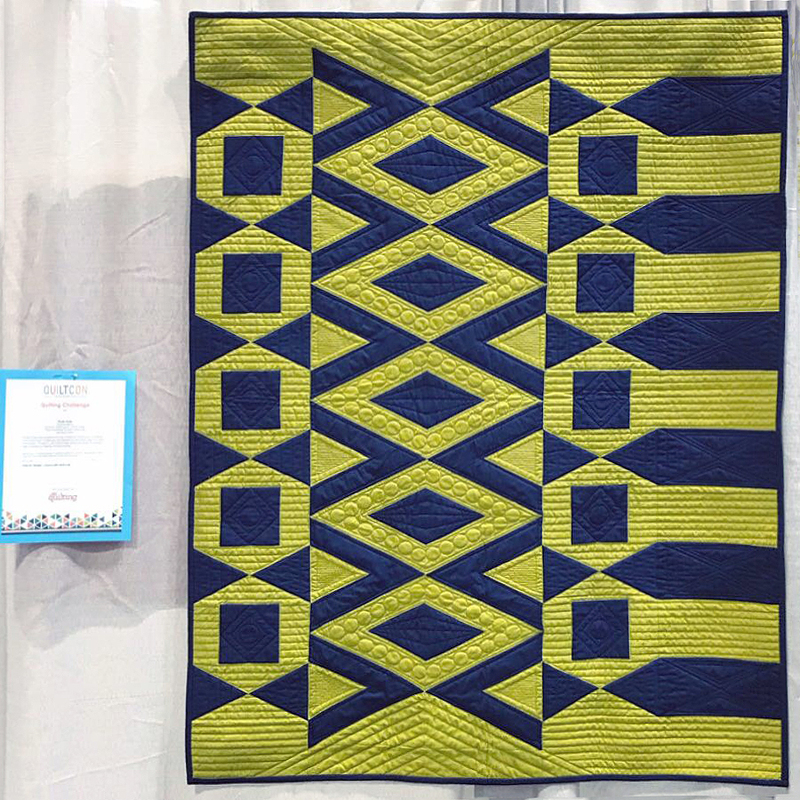 I purposefully extended my QuiltCon stay so that I could be around for the giveaway quilt drawing. I had my fingers crossed that the winner would still be at the show and she was! Eileen was super fun and excited, Christine and I were excited for her. She even noted that her hair matched the magenta centers. I'm so happy I had a chance to meet her and to know the quilt is going to a great home. Overall it was an amazing show! 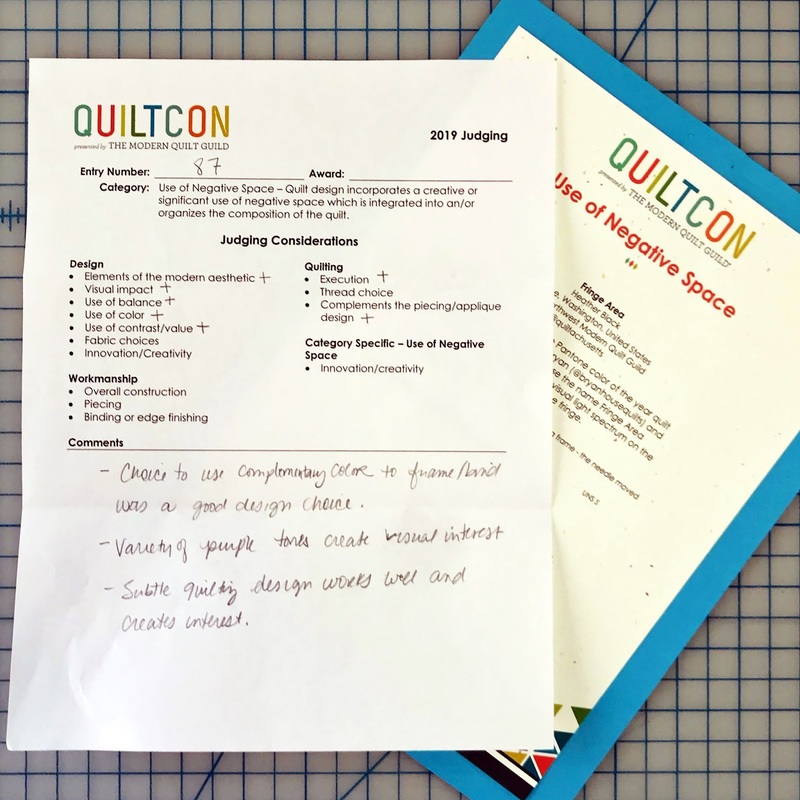 I love going to QuiltCon and connecting was so many amazing people. 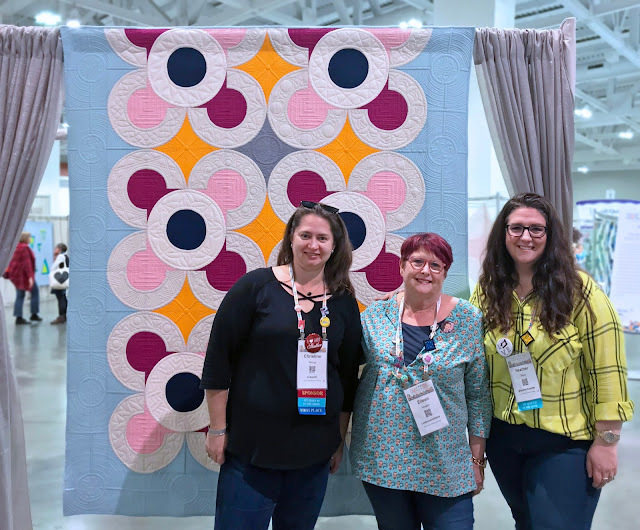 I even got to meet several of my Bee Inspired 2019 quilting bee mates! 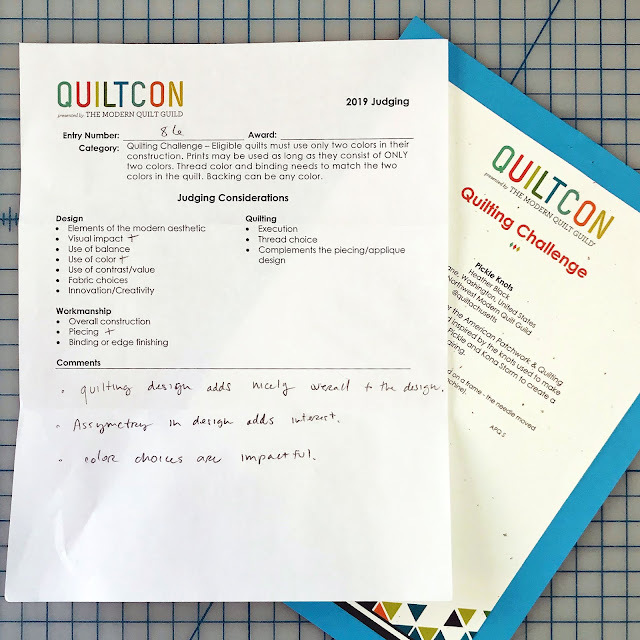 I'm already planning my entries for next year and now that I don't have to average a completed quilt every week I want to focus on improving my construction and quilting. I think that Fringe Area and Pickle Knots are my favourites of your quilts. 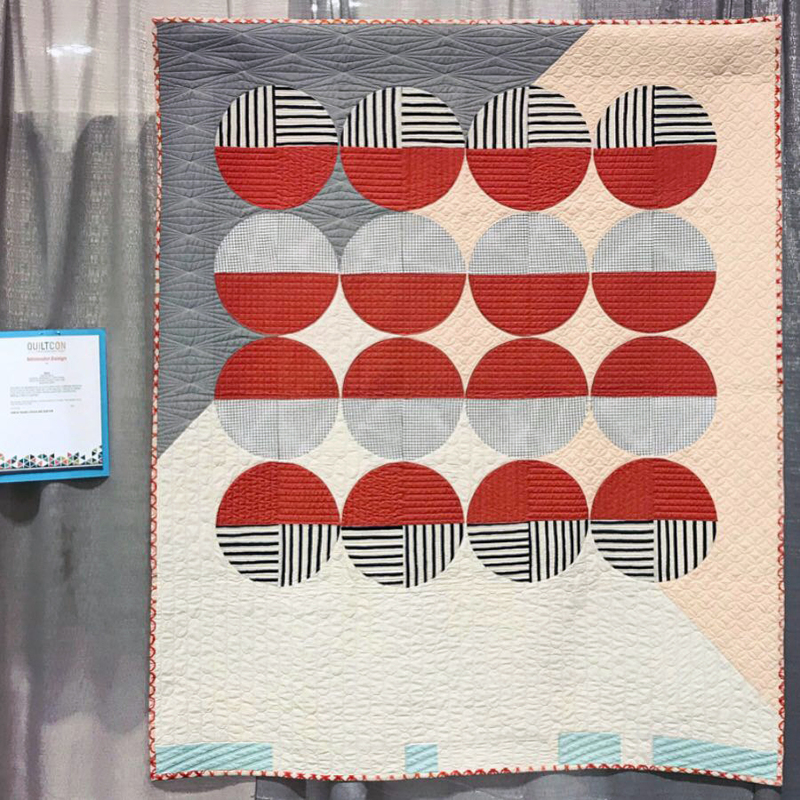 I really like the quilting in Fringe Area, it is quite modern and the unquilted areas add that extra oomph to the look of the quilt. 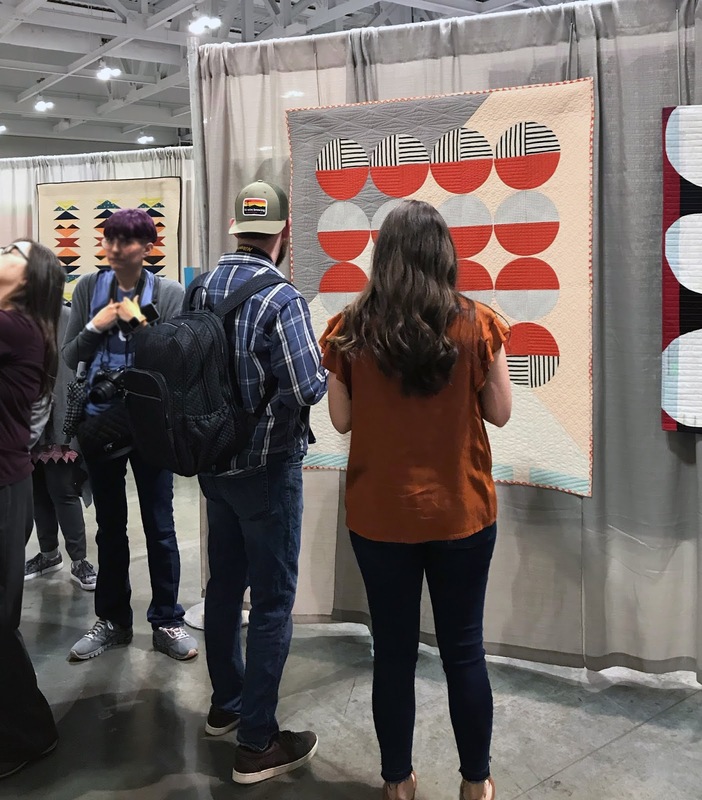 I think it is good to enter quilts in shows, it is such a buzz see your own quilt hanging in a show, we have a saying in our guild "it's an exhibition not a competition". 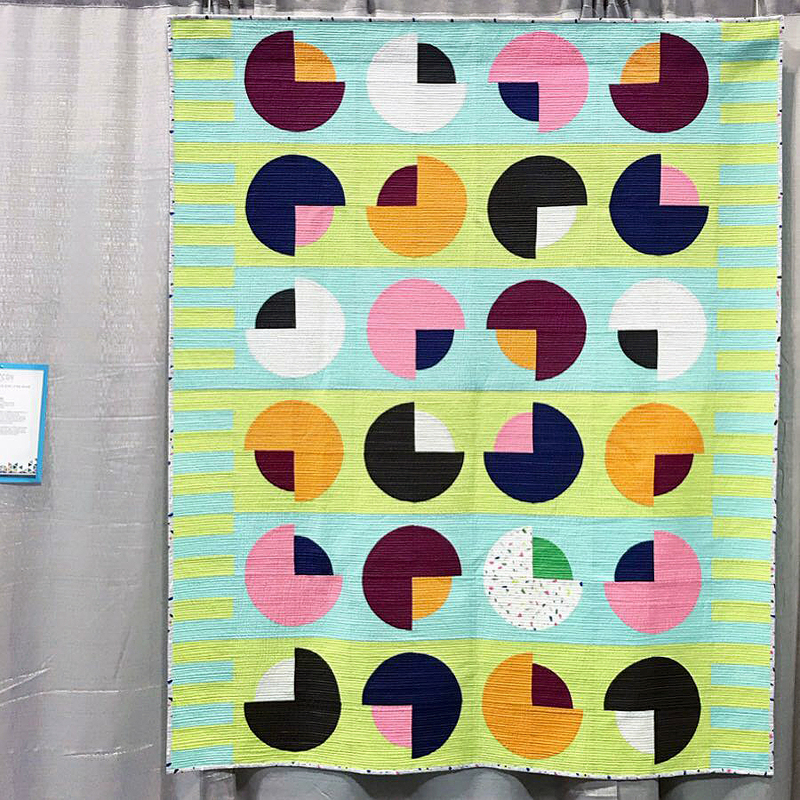 I'm planning on going to Quiltcon in 2020, and I'm intending on making a quilt (maybe two) to enter in the show. Thank you! I love entering quilts too and really appreciate the judges comments, ok some I have to just laugh off, but for the most part I think the judges really try to highlight areas the quilt excels in or areas that need improvements. 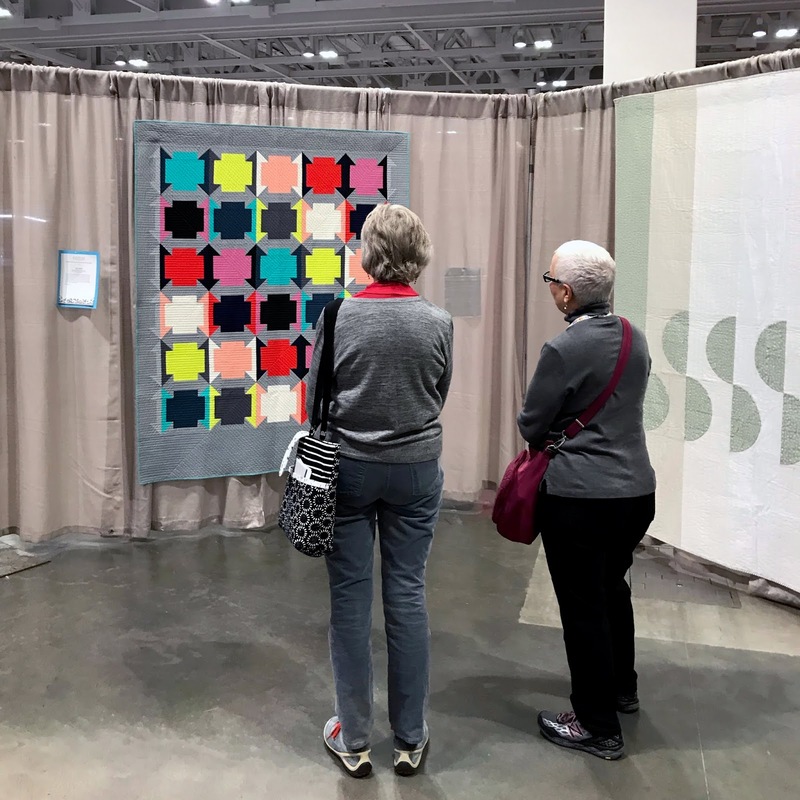 I hope to see your quilts in the show next year. Thank you for sharing the judge's comments! It seems the competition must have been stiff this time around. I also like that you shared how different the comments were on Pickle Knots at two different shows. Proof that every show is different and not getting in or winning at one show doesn't mean you won't get in or win at a different show! My favorite thing is seeing people looking at the quilts! Beautiful quilts!! Thanks for sharing the judges comments - that's always interesting. And yay for the winner of the giveaway quilt! So cool you got to meet her + get the photo with Christine too. So glad we ran into each other several times! Yes so happy to see you so much! I think the highlight of the show was meeting the winner she was so great and fun.